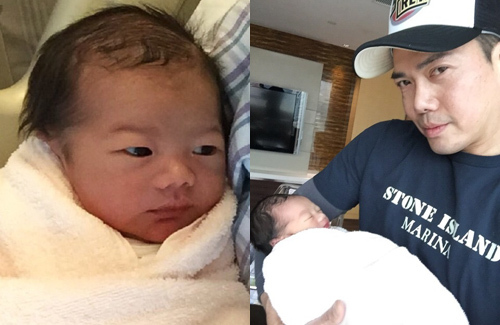 Michael Tse (謝天華) and wife Tina Lee (李天恩) welcomed the birth of their first child yesterday. After trying to have a baby for years, Tina was unsuccessful and attempted in-vitro fertilization four times. Elated when Michael found out the good news about Tina’s pregnancy, he could not contain his nervousness and excitement. Besides taking extra good care of Tina and accompanying her full-time in her final weeks of pregnancy, Michael frequently received parenting tips from good friends Jordan Chan (陳小春) and Jerry Lamb (林曉峰). Despite the original estimated due date at the end of February, the baby arrived several weeks early and in good health. Arriving just in time for the Lunar New Year celebration, Michael could not contain his eagerness and shared photos of his son. In high spirits, Michael also sent out early Lunar New Year greetings to all of his fans on his Weibo blog. The baby resembles him so much!!! Congratulations, Michael. You and your family deserve all the happiness in the world. More to come! Yes,they have the same nose. Congrats to Micheal and his wife. It is great that they finally fulfilled their dream if becoming parents. What a cute little guy! Congratulations to Michael and Tina! Such great news! Glad baby and Mom did well! Welcome to parenthood for sure! Not only cute! . Look at those bright eyes . Going to be a sharp & intelligent kid. Congratulations! Wow so chok already, just like daddy! good for him, he’s been trying to be a father for a while. mission accomplish. Congrats…little prince is so cute…and very alert. sorry to hear! don’t give up, and i hope good news comes to you very soon. don’t give up. 33 is still young. look after your body. I wish you all the best. Tracy – thank you for sharing with me your experience. 1 mc was already hard, not sure how you handled 3. I’m sure you will cherish your two boys for life since you went through so much to have them. I would do the same if I ever have kid again. You must be alot younger than me. I’m going crazy as i’m slowly aging. Thank you ladies for all the wishes! Tracy – I was so strong for the whole year but I’ve bern feeling down when Feb came. I did not work the week and not sleeping well. Maybe I’m getting depression? I would like to get more info from your experiences… Can you talk about it? You need to relax in order to get pregnant. Don’t be so stressful. 33 is still a young age to have babies. If you don’t worry about it, then you will get pregnant easily. Sorry, i didnt see this message until today. I meant can we talk about this? yes, just give your general email. i’m sure many helpful people, mothers, able to share their precious experience, knowledge with you. Be determined, hopeful, positive spirit helps. God help those who help themselves. jaynestars has many nice people. Keep believing. You are great. There are many who didn’t want to have kids after married. You are the best. You can do it! I know it sounds easier for us to say than for you to endure the long wait. But don’t ever give up. Sometimes miracle happens when you least expect it. Just don’t stress yourself. I understand your feeling for what happened but dont feel too sad or it will affect you again. Now you have to relax and dont put yourself too hard. 33 is still ok. Hope to see good news from you again. Sorry to hear about your miscarriages Rain. My mom went through 5 on her life but still managed to gave 9 kids,but lost one during babyhood and my dear,brother a few years ago. It is very hard to go through miscarriages and/or losing a child,but you still have to stay strong and hope for a better tommorrow. Best of luck to you and hope you will become a parent soon. Meant to say in her life and managed to have.. Gosh,I need the edit button! You are still very young, so there is always chance to conceive a healthy baby again. Many women have experienced miscarriages before and gone on to have healthy babies. Talking about it with a friend or family members who have also experienced miscarriage will help you deal with the loss better. There are more women than you think who have experienced the same, but they may not have spoken about it, since most miscarriages occur in the early weeks of pregnancy. My friend conceived with the help of an ovulation kit. Perhaps you can look into it as it may increase your chances of successful conception with the right timing. Also, you can always ask your doctor what are some supplements and vitamins, such as folic acid, to take to best prepare your body, so that it is in optimal state for conception. Thank you so much all! I appreciate all the encouraging words. I don’t have any infertility issues, I think mainly is I’m scared to try and also do to stress. Congratulation to Michael & wife! Baby so adorable & has very nice feature. Tian Tian is the name right? Rain, may you have good news soon! God Bless You! Proud of Michael. He committed to his son to make him a great man. Really nice of him, his thankfulness to his son and his wife in his life. God bless this family. Laughing Gor must be very happy now…I guess we can all feel the same for him, after waiting so long to have this baby. Little prince will grow up to be as charming as daddy. I believe he is a horse baby? Yes,he is technically a horse still the goat is not here yet. Is that really the baby’s name? If so,great name and Micheal will be a great father! Yes, it’s Michael baby real name. Saw his interview with TVB reporter and the interview printed in HK newspapers, magazines. Michael chose the Chinese name Tse Ho Fei (Fei is fly in Cantonese, meaning so happy until fly). His wife chose the English name Theo. Please allow me to clarify your doubt. Thank you. For those who believe in Chinese animal zodiac sign, the whole world follow the traditional Chinese Almanac calendar. If not, follow the English zodiac sign, Capricorn, Cancer, Libra, etc. Ask any real Chinese astrologer practitioner who will tell you every year Li Chun falls on Feb 4 (English calendar) the next Chinese animal sign comes in officially, regardless when the 1st day of the 1st lunar month is (Chinese calendar). The only difference every year is the time Li Chun happen. For 2015 is Feb 4 at 11:58am until 7:52pm 2016 Feb 4. Babies born on and after this time, are all officially born in the year of Wood Goat. Whether you believe or not, even if you do not accept, this is the fact. No one can change the Chinese almanac (tong shu) or (tong shing). In today era, just google the answer. Please search and read up the truth. Perhaps, Michael baby born after 11:58am on Feb 4, if so, then his baby is born in Wood Goat year, month of Earth Tiger. If not, he is still Wood Horse baby. For those who born in spring and mistakenly think they are born in that animal sign, then the birth forecasting reading will be wrong. Congrats him. Hope my baby will be as cute as that. The baby has his nose! hehe. Congrats to Michael and his family! Congratulations, Michael and Tina. Your son is very cute. Have another one next year. One is not enough. Congratulations to the proud and happy parents, Michael and Tina! You have a gorgeous looking boy! Beautiful baby boy! HE is sooo cute!! Takes after his dad already!! haahhaha!! He could become a model !?!! he looks exactly like daddy.